Ultrasound is an oscillating sound pressure wave with a frequency greater than the upper limit of the human hearing range. Diagnostic sonography (ultrasonography) is an ultrasound-based diagnostic imaging technique used for visualizing subcutaneous body structures including tendons, muscles, joints, vessels and internal organs for possible pathology or lesions. Because ultrasound images are captured in real-time, they can show movement of the body’s internal organs as well as blood flowing through blood vessels. It has been mostly developed within the last 30 years. The first ultrasound images were static and two dimensional (2D), but with modern day ultrasonography 3D, reconstructions can be observed in real-time; effectively becoming 4D. Obstetric sonographyis commonly used during pregnancy. Medical ultrasonography uses ultrasound (high-frequency sound waves) to visualize soft tissues structures in the body in real time. A hand-held transducer is positioned over the skin. The transducer throws out high frequency sound waves that reflect off of body structures. The returning sound waves, or echoes, are displayed as an image on a monitor. The image is based on the frequency and strength (amplitude) of the sound signal and the time it takes to return from the patient to the transducer. No ionizing radiation is produced, so it does not have the same risks as x-rays or other types of ionizing radiation. When ultrasound enters the body, it heats the tissues slightly. In some cases, it can also produce small pockets of gas in body fluids or tissues (cavitation). Quality of the images obtained using ultrasound is highly dependent on the skill of the person performing the exam. The use of ultrasound has the inability to image through air (lungs, bowel loop). 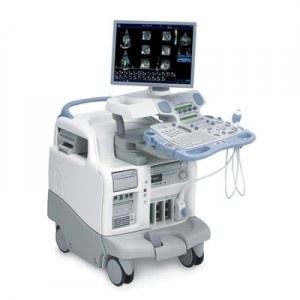 Ultrasound is widely used in field of Obstetrics. 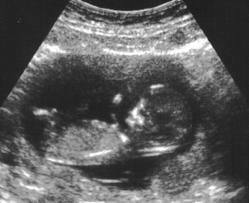 Fetal anatomic development can be thoroughly evaluated allowing early diagnosis of many fetal anomalies. Growth can be assessed overtime; Application of ultrasound has played an important role in with patient with chronic or gestational induced disease and in multiple gestations. Ultrasound is useful for image-guided interventions likes biopsies and drainage such as (thoracentesis) . Sonography is effective for imaging soft tissues of the body. Superficial structures such as muscles, tendons, testes, breast, thyroid and parathyroid glands, and the neonatal brain are imaged at a higher frequency (7–18 MHz), which provides better axial and lateral resolution. Deeper structures such as liver and kidney are imaged at a lower frequency 1–6 MHz with lower axial and lateral resolution but greater penetration. Color flow Doppler ultrasound. It measures the severity of peripheral vascular disease and is used in Cardiology for dynamic evaluation of heart, hearts valves and major vessels. Stenosis of Carotid arteries can presage cerebral infarcts (stokes). DVT in the legs can be found via ultrasound before it dislodges and travels to the lung (Pulmonary Embolism), it can be fatal if left untreated.